You’re buying a house… this is no time to cut corners… and certainly not a time to skip a home inspection. 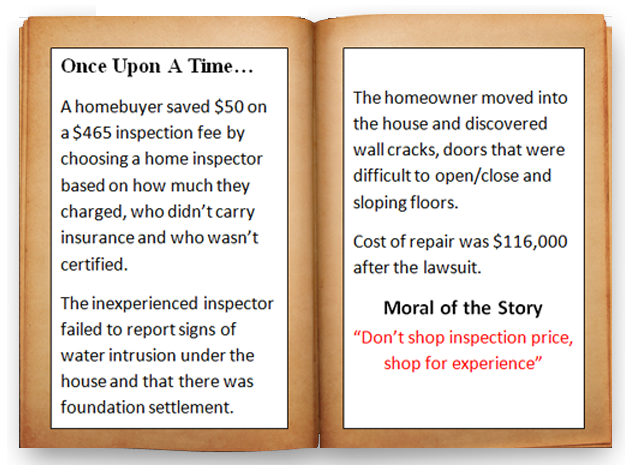 The cost of a home inspection is very small relative to the value of the home being purchased. The additional cost of hiring a professional certified property inspector is almost insignificant. Many home buyers… either in their desire to save fifty bucks or due to simple ignorance… have spent several thousand dollars repairing items after moving in that a good home inspector would have pointed out. Do Not let anyone – not the real estate agent, not your family or friends and especially not the seller – dissuade you from having the property thoroughly inspected. Do yourself a favor… and pay for a high quality home inspection you deserve, and for the peace of mind of knowing your home is ready for you.